The intersection of feminism and Islamic identity. How compatible are the two? With Shakira Hussein, Eliza Vitri Handayani, and Monique Toohey. Here’s a recording of the session, presented as part of “Big Ideas” by Australia’s ABC Radio National. Her novel From Now On Everything Will Be Different was sold out at the event. How powerful is art as a tool for protest? With Molly Crabapple and Eliza Vitri Handayani, and moderator Omar Musa. Why do we write? Writers from Asia and Australia reflect on what writing means to them. With David Carlin, Maggie Tiojakin, Michele Lee, Dai Fan, Lawrence Ypil, Alice Pung, and Xu Xi. Eliza was also one of the surprise guests at Dumbo Feather‘s Caravan Conversation. 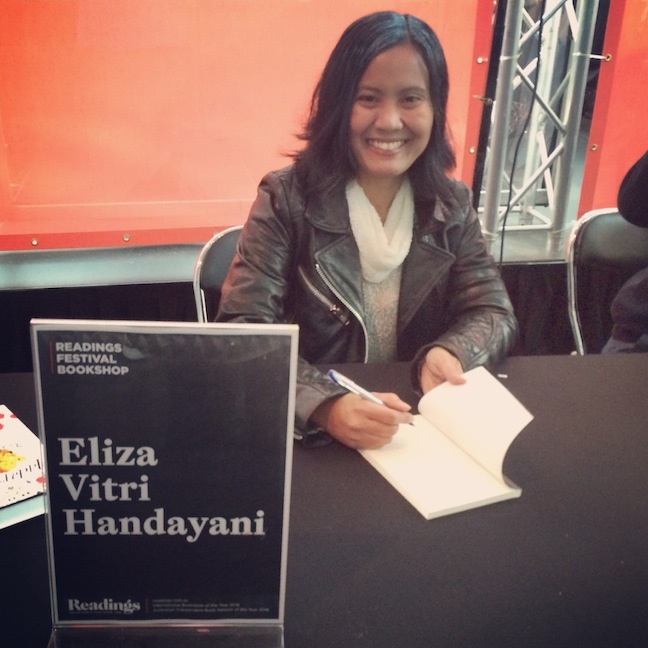 During the festival, Eliza gave many interviews including to ABC Radio National (with Patricia Karvelas), Joy FM, Australia-Indonesia Youth Association, and the Leader newspaper. After Melbourne, Eliza continued her Australia tour and went to Sydney and Adelaide promoting her novel From Now On Everything Will Be Different.